With winter officially here, many people turn to a wide-range of remedies to battle cold and flu season. These solutions are helpful when trying to prevent a runny nose, but did you know that some of them can affect your oral health? 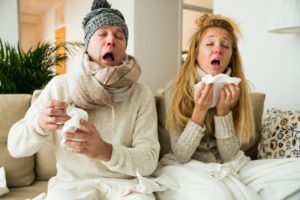 Read on to learn about some of the most common cold and flu remedies and how they can affect your teeth from your local dentist. Decongestants are great at drying out your nose to stop the annoying flow of mucus, but did you know it dries your mouth out too? Dry mouth can promote the growth of bacteria, which can raise your risk of gum disease and tooth decay. Fortunately, you won’t have to use decongestants for too long, but you should still combat dry mouth to prevent any lasting oral health issues. Be sure to drink water to keep your mouth hydrated and chew sugar-free gum to stimulate saliva flow. That will keep your mouth healthy, while still allowing you to solve your runny nose problem. Cough drops or throat lozenges stay in contact with your teeth for long periods of time because they dissolve slowly. Many of these products contain sugar, which gets in your saliva and coats all of your teeth. Sugar turns to acid that eats away at your smile, so your best option is to choose sugar-free products. That way, you can get relief without heightening your risk of tooth decay. Just like cough drops, a lot of liquid medicines contain sugar. These liquids are sticky and thick, so they coat your pearly whites with ease. Some of these products also contain alcohol, which limits your saliva flow and makes it harder for your mouth to naturally wash away the medicine. If possible, choose remedies that come in pills or gel-capsules to limit the contact your medicine has with your teeth. However, if you really like taking a certain liquid medicine, just be sure to brush your teeth thoroughly after taking it. Many people turn to their favorite tea for an at-home solution when they have a cold. While tea is better for you than sugary sodas or sports drinks, it still comes with some oral health concerns. Tea can contribute to tooth erosion. Plus, black tea is worse for your teeth than green tea because it can stain. To minimize chances of erosion, try drinking your tea through a straw. This is an easy way to avoid unnecessary contact the liquid makes with your teeth. Also, try not to use any sweetener like sugar or honey because that will increase your risk of decay. Now that you know how some common cold and flu remedies affect your oral health, you can take care of winter sickness and your teeth in the healthiest way possible. Use these tips to relieve your stuffy nose and sore throat without damaging your teeth! A graduate of the LSU School of Dentistry in New Orleans in 1982, Dr. C.J. Landry has been providing quality care for his patients ever since. He believes in patient education, which is why he wants you to know some of the oral health risks associated with cold and flu medicines. He currently practices at Lapalco Family Dental in Marrero, and he can be contacted through his website or by phone at (504) 348-0080 for any questions.